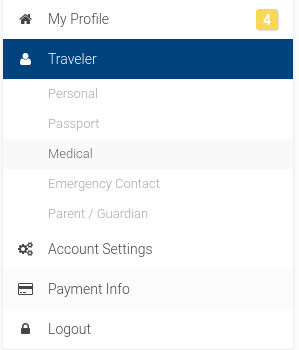 To update your medical information, go to My Profile, click on Traveler on the left-hand side, and then click on Medical. If you have a medical condition click "Yes, I have a medical condition", describe your condition in the box below, and click "Save". Please provide as with much detail as possible, and describe your specific requirements for travel. 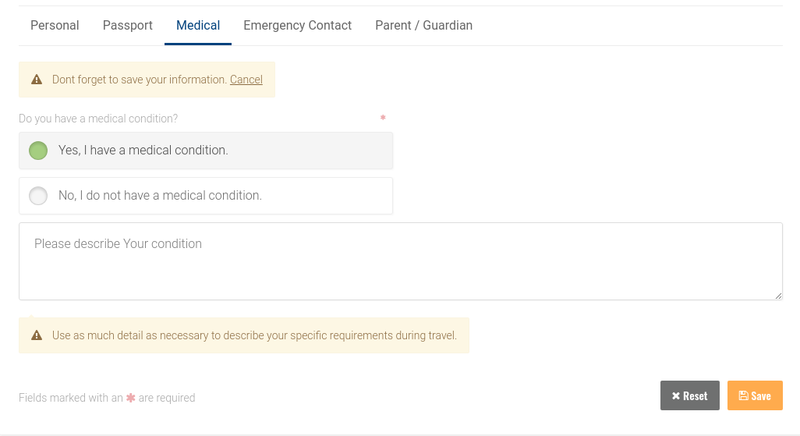 It is also recommended that you send us the Medical Form to give us more detailed information/instructions as needed. A Breakaway Leader will meet with any traveler that has a medical condition at the briefing/during check-in to discuss their condition. We like to have a face-to-face discussion with these travelers to make sure they have everything they need and that they know what to do in the case of an emergency. If you have an allergy, feel free to review more information here.